Private workshops, small groups, or schedule a workshop at your venue or community space. There is no better way to spend a day than working with your hands to create a unique and beautiful piece of art that you can treasure for the rest of your life. That is why it is important to me to offer many options for learning— you can start with my 2017 Workshop Calendar, but if you want to schedule a workshop at your own venue take a look at the options below. I can also accommodate your schedule and preferences through scheduling a private workshop (see bottom of page for details). Have an idea for a workshop that you don’t see here or want to inquire further about scheduling a workshop? Contact me at KatieGroveArt@gmail.com or fill out the form below and let’s get weaving! Have you ever looked outside at the abundance of plants in your yard and wondered what you could make with them? 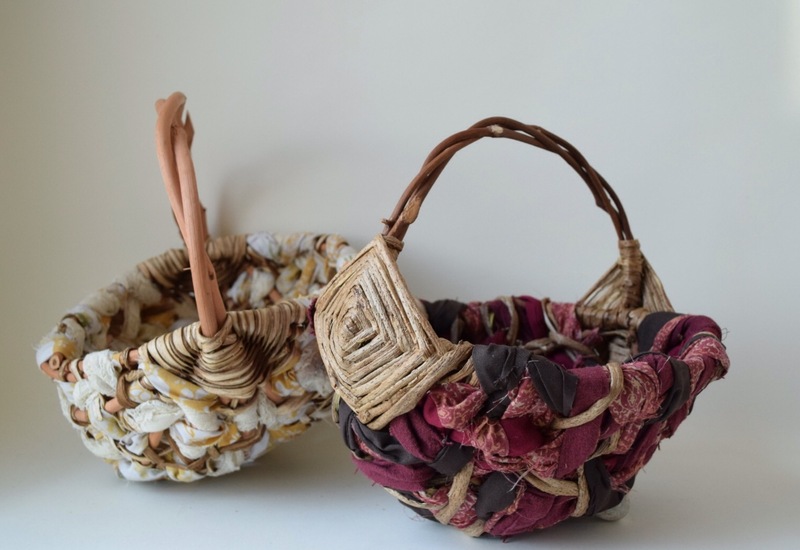 If you are interested in making beautiful and useful objects out of natural materials then coiled basketry is perfect for you. Coiling is an ancient technique in which rows of material are layered and sewn together one row at a time in a spiral to create a basket. In this class we will use split cattails and grasses as the core of our baskets and natural colored yarns as our sewing material. Several open work stitching techniques will be covered, including line stitch, v stitch, and core wrapping to create a lovely pattern over the cattails and grasses. Coiling is a versatile and fun technique and each participant can choose the shape and size that they want for their own unique basket. 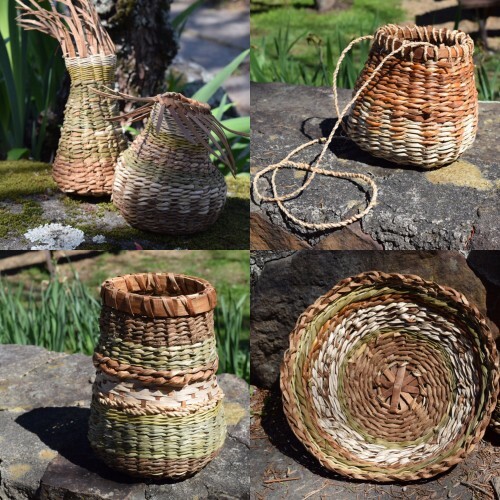 We will also discuss how to harvest and prepare cattails and grasses for coiling so that you are prepared to continue making one-of-a-kind coiled baskets at home. Twining is technique in which two weavers are twined around splints to create a tightly woven and solid basket. Used by indigenous people all over the world, twining is a technique that can be adapted to use with many different long flexible materials. In this class we will use locally harvested cattails for weavers and white ash bark for splints. 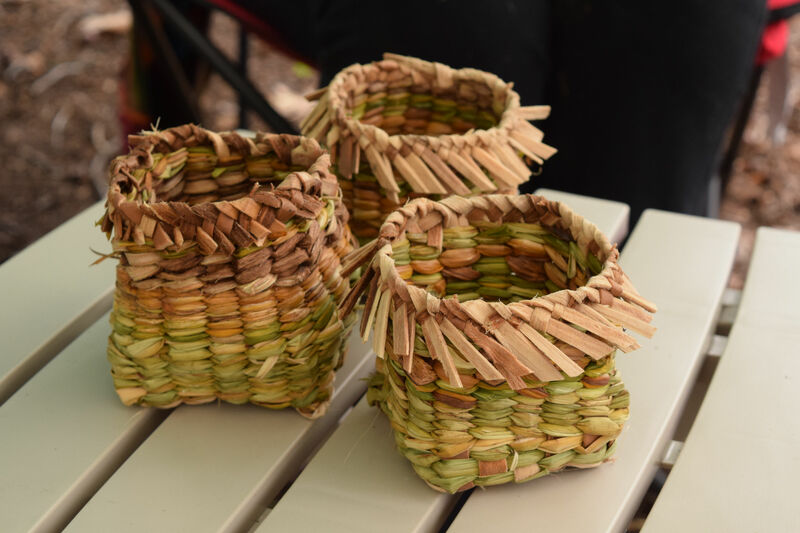 Participants will also have the opportunity to stripes of contrasting colored kudzu, red cedar, and other natural materials to their basket for color and variety. Both two and three strand twining will be used to create a lovely small sized basket. 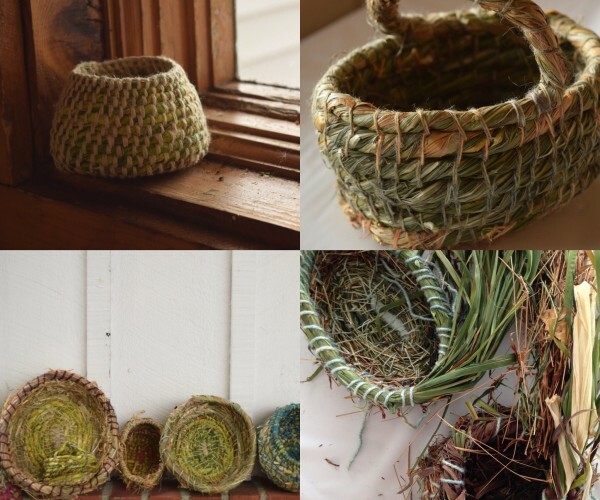 During this one day workshop you will learn the art of creating coiled baskets using long-leaf pine needles. 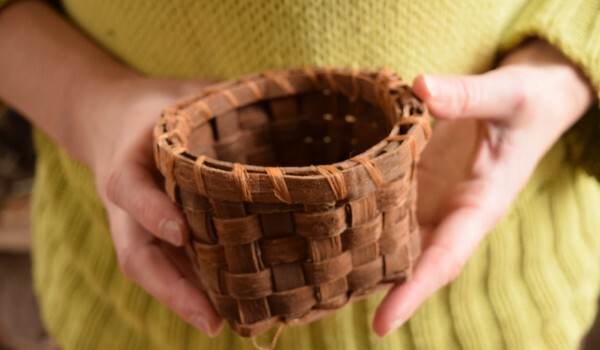 In addition to making a small to medium pine needle basket, you will also learn the history of this art form, spend a day in good company creating a one of a kind piece of art, and come away with the knowledge to make many more baskets. You will have the opportunity to learn several different decorative stitches and create a unique basket using a variety of different wrapping materials and embellishments in addition to pine needles. This class is good for either someone that has some basketry/sewing experience or enjoys working with their hands on a small scale project. This basket is a fiber lover’s dream! You will make a traditional Appalachian egg basket with a twist– fabric and yarn will be incorporated amongst natural materials to create a fun and colorful look. We will start with a grapevine frame with 3-point lashing and then use random weave techniques to give the basket a soft but sturdy construction. I will share techniques for creating well-woven random weave while also maintaining a balanced look. There is a lot of room for your individuality to shine in this basket and I encourage you to bring fabrics and yarn that you love to incorporate into the basket. This is great for quilters, spinners, knitters, and other fiber loving folks. In this workshop participants will learn the ins and outs of working with locally harvested inner bark splints and other natural materials to make a straight plaited (checkerboard pattern). Starting with a grid base we will cover basic bark weaves for the main structure of the basket. Twining, decorative wrapping techniques, and cordage will also be introduced, giving students an opportunity to add unique embellishments to their baskets. In addition to learning the various weaves, students will get hands on experience splitting and prepping some bark. During the workshop we will discuss how to identify, harvest, and prepare a variety of local natural materials, including tree for bark. If you are excited to use locally harvested materials for basketry while creating a beautiful and useful basket then join us! You will go home with a completed basket, information on the topics covered, and inspiration to keep weaving. Beginners welcome. 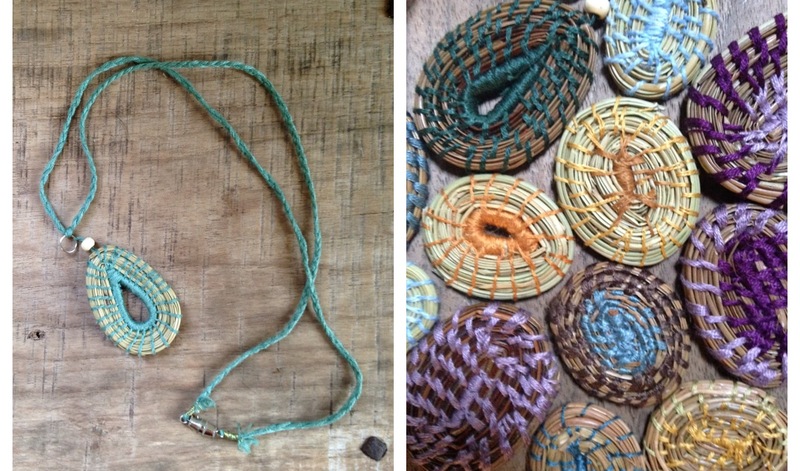 In this workshop the traditional basketry technique of coiling with pine needles will be adapted to create one-of-a-kind pendants. Participants will have the opportunity to make several pendants and then create earrings, necklaces, bracelets, or any other jewelry item of their choice. Materials fee includes all jewelry findings, beads, cords, and a bundle of pine needles to make several pieces. 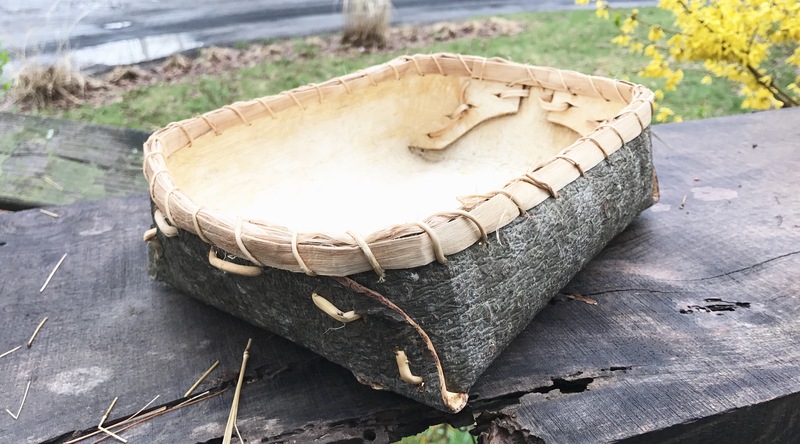 In this workshop participants will learn how to design, fold, and sew their own container using sheets of white pine bark. We will discuss how to locate and harvest pine bark as well as storing and preparing it for use. The bark based will include attaching a rim and handles if desired. 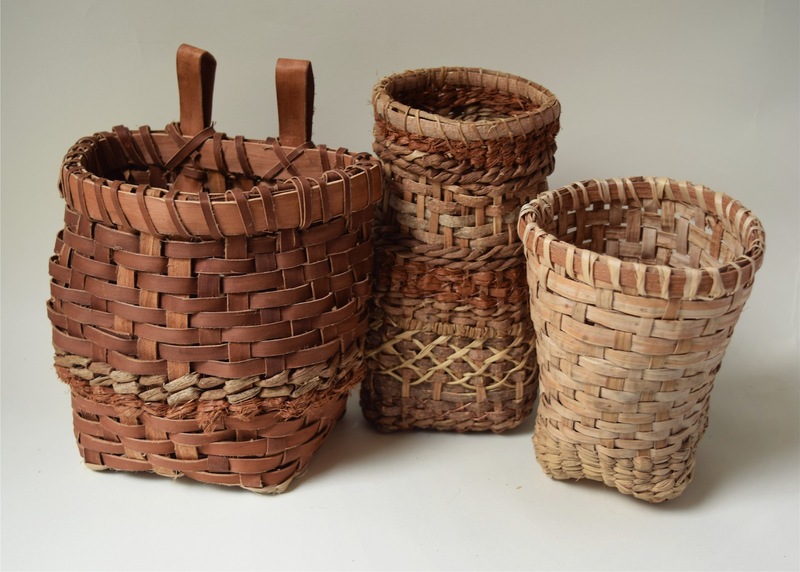 In this workshop participants will learn the basics of working with locally harvested inner bark splints to make a straight plaited (checkerboard pattern) basket Starting with a grid base we will cover a basic bark weave for the main structure of the basket as well as attaching a rim. You will go home with a completed basket, information on the topics covered, and inspiration to keep weaving. Beginners welcome. Want to really go deep into learning to work with natural materials using several different basketry techniques? In this class you get it all: hands on experience harvesting and processing materials to make either two small baskets or one larger one (approx 7″ x 7″ x 12″) With a base of prepared bark stakes participants will learn two essential basketry techniques: twining with cattails, iris leaves, and vines, and a beautiful twill pattern using bark splints. We will also cover cordage, a variety of different rim types, and add decorations to your baskets. During the course of the workshop participants will get hands on experience splitting bark, processing vines, and other seasonally available materials. You will leave both knowing basic basketry techniques with an introduction to a great variety of wonderful plant species that can be used to weave. Beginners and experience weavers welcome. In the coiling technique a bundle of material is built up through sewing a spiral until it becomes a vessel. 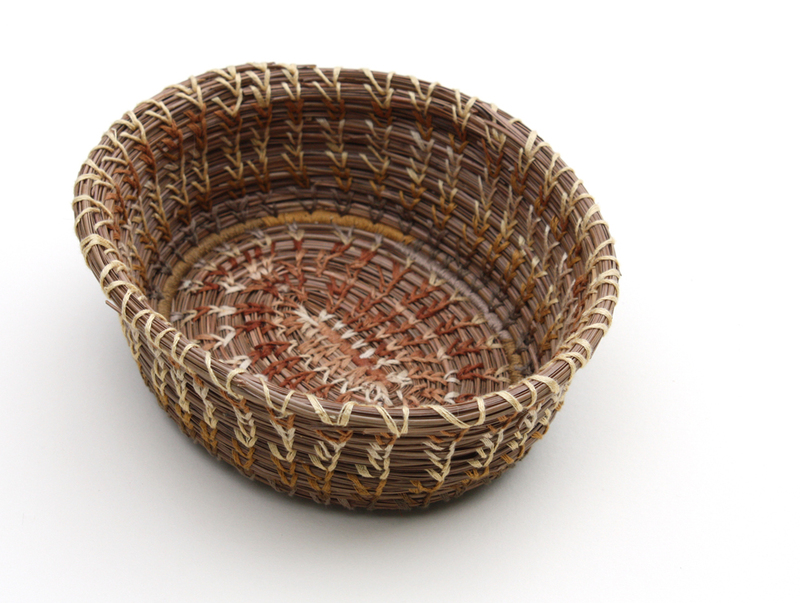 The shape and size is completely up the maker and when one allows themselves to relax and just create the basket becomes a very personal expression of oneself. 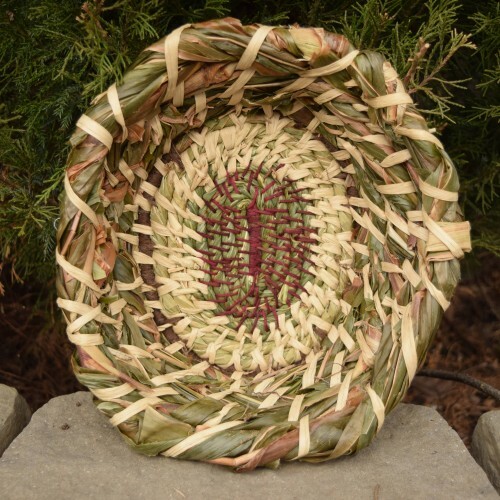 In this meditative and reflecting workshop participants will work with a variety of natural materials to create a large basket (approx 20″ x 20″ x 10″. Both line stitch and more advanced wrapping techniques will be covered as well as adding handles to the basket. Cattails, grasses, sedges, iris leaves, and other locally abundant materials will be used, making this a great class for someone who wants to go home and harvest their own material. We will discuss different plant species, how to harvest and store them, and if location permits, even harvest some materials ourselves. This is a great class for beginners or those who want to make a larger project. If you and a small group of friends want to have a relaxing, fun, connective day in the comfort of your own home then a private workshop is a great option. Any location greater than 30 miles from Rosendale, NY will include travel expenses. Please contact me for pricing and so we can decide on the perfect workshop for your experience.